The studies of agenda setting show that the news media play an important role in what the public thinks about and the policy outcomes that result from changes in public opinion. In a 1993 review of literature, Everett Rogers, James Dearing and Dorine Bregman found 223 publications that explicitly or implicitly concerned agenda setting, a concept popularized during the last three decades to document whether news coverage is a significant predictor of shifts in public opinion. Of the publications they examined, 59 percent concerned mainly the relationship between the media and its corresponding public agenda. In 1996, Dearing and Rogers discussed the results of more than 350 “publications” on agenda setting. In 2004, Max McCombs discussed more than 400 “empirical studies” of agenda setting. While the research on agenda setting continues to grow, both in breadth and depth, the majority of it still focuses, as the original research did, on the relationship between the media and public opinion with little research on policy outcomes. This research, however, extends the original ideas by going beyond public opinion to examine the impact of the local media on local government public policy. While numerous studies have shown that news coverage is a significant predictor of shifts in public opinion, few studies have extended the basic idea of agenda setting into the policy domain and fewer still into local government policy. Awareness of a strong link between mass media and local policy outcomes will help local government officials determine how to allocate resources and how they can best use the media. In a time when the role of the media was less certain, McCombs and Donald Shaw set out to show whether the interests of voters, and the magnitude of that interest, coincided with the coverage in the media of issues in a presidential campaign. They declared, “The media appear to have exerted a considerable impact on voters’ judgments of what they considered the major issues of the campaign.” (McCombs and Shaw, 1972). Their study popularized not only a concept, “agenda setting,” but also a methodology: identify what voters say are the key issues and compare that to a content analysis of the media those voters say they use. Part of what McCombs and Shaw did was not new. Indeed, one of the pivotal questions in their interviews of 100 randomly selected voters living in Chapel Hill, N.C. was based on a question in a cross-sectional study by Joseph Trenaman and Denis McQuail (1961): “What are you most concerned about these days? That is, regardless of what politicians say, what are the two or three main things which you think the government should concentrate on doing something about?” Using this “most important problem” idea, McCombs and Shaw, at the same time, analyzed the content of the media covering national issues in the area. Specifically, they analyzed the news and editorial content in four daily local newspapers, a national newspaper, two news magazines and two evening newscasts (from which a previous survey determined residents obtained “almost all” of their political information). The five main issues cited by the voters were fiscal policy, foreign policy, law and order, fiscal policy, public welfare and civil rights. McCombs and Shaw “attempted to match what Chapel Hill voters said were key issues of the campaign with the actual content of the mass media used by them during the campaign.” They hypothesized that residents were too far removed from the national political scene to know what lawmakers in Washington, D.C. were doing about pivotal issues and that most of what people know comes to them “second” or “third” hand from the mass media or from other people. Concurrently with their voter interviews, they collected and analyzed the content of the mass media Chapel Hill residents said they used: the Durham Morning Herald, the Durham Sun, the Raleigh News and Observer, the Raleigh Times, New York Times, Time and Newsweek as well as NBC and CBS evening news broadcasts. Their content analysis coded the content into 15 categories and defined content as either major or minor to see whether there was any substantial difference in mass media emphasis across topics. The correlation between major items and the voters’ independent judgments of the important issues was r = +0.967. With this methodology, McCombs and Shaw set forth a pattern of research, repeated in other studies of agenda setting, that involves seeing whether there is a correlation between public opinion and media coverage. Subsequent cross-sectional studies, such as those by Canel, Llamas and Ray (1996) and Takeshita (1993) and Lennon (1998), also found positive correlations between the public agenda and the media of between r = 0.39 and r = 0.90. Based on comparisons of public policy issues at specific dates, cross-sectional studies have the disadvantage of being useful only for a limited period of time and sometimes reach over-simplified results. As Frank Baumgartner and Bryan Jones (1993) indicate, however, the authors of such studies do not claim that their findings will be valid for all time. They do, however, provide useful snapshots and short-term insights. The cross-sectional approach attempted to compensate for problems with other similar studies by using data that (1) were national in scope to ensure maximum variance; (2) included measures of media content to avoid imputing effects to the mere fact of media exposure; (3) included real-world measures to control for relevant local conditions; and (4) linked media content, real-world conditions and salience perceptions at the individual level to circumvent the pitfalls of aggregating across heterogeneous populations. 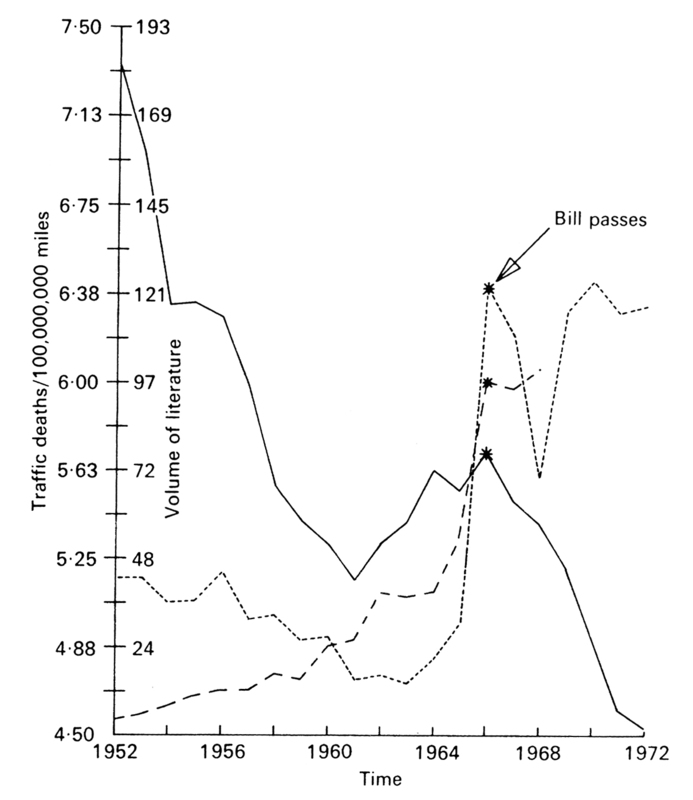 Figure 3: Highway Safety Act, 1966. 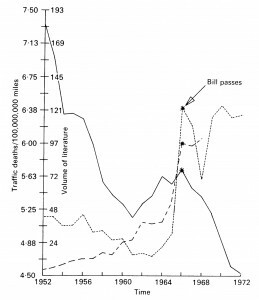 For example, Jack L. Walker (1977) told how a window of opportunity opened in 1966 for the Highway Safety Act following an increase in both mass media coverage and coverage in other media (figure 3). The legislation that ultimately passed followed years of action in the parallel streams. In the problem stream, a study by the National Academy of Sciences and increased traffic deaths drew attention to the problem. In the political stream people such as Abraham Ribicoff, Robert Kennedy and others were elected or appointed to offices in which they could focus on the problem. The policy solutions, already out there, included those by Federal Highway Administration engineers who were advocating for reform of the automobile itself by professionals lobbying for driver training courses in high schools and by other groups lobbying for improved signs and lighting for highways. Action required a window of opportunity to develop recognition of the need. That window was pushed open by a dramatic increase in the amount of reporting in the mass media in 1966. Of course, the statistical analysis reveals that the media were followers, not leaders. Experts had been engaging in debate for more than a decade prior to the emergence of legislation. As a result, policy entrepreneurs took advantage of an opportunity and caught the attention of Congress and the media. As the streams merged together, the solutions were present and the policy window opened to allow passage of the legislation. Whether such streams can come together to influence policy outcomes at the local level remains to be seen. An interesting aspect of this study was the inclusion of a third measurement of the salience of an issue, a real-world indicator — the number of deaths per 100 million miles driven. Use of the indicator followed the methodology set by F. James Davis, who looked at the correlation between crime news and crime coverage in Colorado newspapers. “There is a marked lack of association between the percentage changes in total Colorado crime and in newspaper coverage” (Davis, 1952). Media coverage did not correlate to real-world events, but public opinion, at least in part, was influenced by the amount of crime news rather than in actual crime rates. Baumgartner and Jones (1993) also looked at how real-world events got on the agenda in American politics, again at the national level. Examining nuclear power, tobacco and pesticides, they noted that policy changes occur both incrementally and in bursts. While their model accounted for long periods of stability, it was the bursts of change and what precipitated them that were often of the most interest as sometimes entrenched economic interests found themselves suddenly on the losing side of a political battle. Small policy changes are easier than large policy changes because they require less energy, draw less attention and attract less opposition. In this equilibrium, however, punctuations such as the legislation that created Johnson’s Great Society or the Civil Rights Act are significant. When applied to the content of the federal budget, Jones, Baumgartner and James L. True (1996; 1998) showed that the majority of the changes in the federal budget are almost insignificant. However, they noted that budget changes follow a Paretian distribution, having a higher frequency of large or extreme changes and resulting in punctuations that represent major changes in the agenda. The media were a major source of instability because reporters’ efforts, as other agenda-setting studies have shown, correspond to official concerns. The media play an integral role in the policy process by directing attention alternatively toward different aspects of the same issues over time and by shifting attention from one issue to another. The scholars also showed how media outlets amplify elite-level disagreements as they focus on conflict and try to simplify complex situations. “Media reporters, interested in conflict and disagreement, become the winning or unwitting allies of those who want to create the impression of greater disagreement and who want to focus public attention on sensational fears” (Baumgartner and Jones, 1993). Although the controversies and disagreement may impact far fewer people at the local level than automobile safety or nuclear industry regulation at the national level, the media’s ability to direct attention toward and away from various issues is no less significant. The theories of Funkhouser, McCombs and Shaw, and with the impact of research by Cohen, Baumgartner and Jones, eventually evolved into a broader theory by John Kingdon, whose multiple streams concepts model how policy change might occur. Kingdon (2003) emphasizes that the media may be important in interesting ways and under specific circumstances. First, he recalls what Cohen (1963) said about the media acting as a communicator within the policy community. Lawmakers, even those at the local level, are busy people who have many tasks to perform on a daily basis. At the local level, their policy-/law-making roles may even be in a volunteer capacity, not full-time. They rely on the mass media to stay informed about problems and solutions. At the national level, Kingdon (2003) quoted a staff agency analysis, “We can write reports and papers, and they don’t read it. But if the Times or Post picks up our report and does a story on it, they do read that, and it gets their attention.” Bureaucrats report that issues may not make it to the attention of the White House until the same issues are reported in the Post. Whether the media play the same role at the local level remains to be seen. Second, Kingdon notes that the media may affect the agenda by magnifying movements that were started elsewhere instead of originating the movements. Leaks in and around Washington law office provide the prime example. Because conflict is inherent in media coverage, a leak that puts the losing side in a more favorable light reeks of conflict and causes reporters to pounce. In this case, the reporters were willing predators in their attempt to shape and to structure an issue if not to create it. The Media Agenda, Public Agenda and Policy Agenda. Third, Kingdon brings back the notion of the indirect effects of the media. As media outlets draw attention to an issue, members of the public write their representatives in Congress to find out what the lawmakers are going to do about it. Arthur Miller, Edie Goldenberg and Lutz Erbring (1979) concluded that the readers of newspapers containing a higher degree of criticism directed at local politicians and political institutions were more distrustful of government and also somewhat more likely to believe that the government was unresponsive than were readers of newspapers containing less criticism. 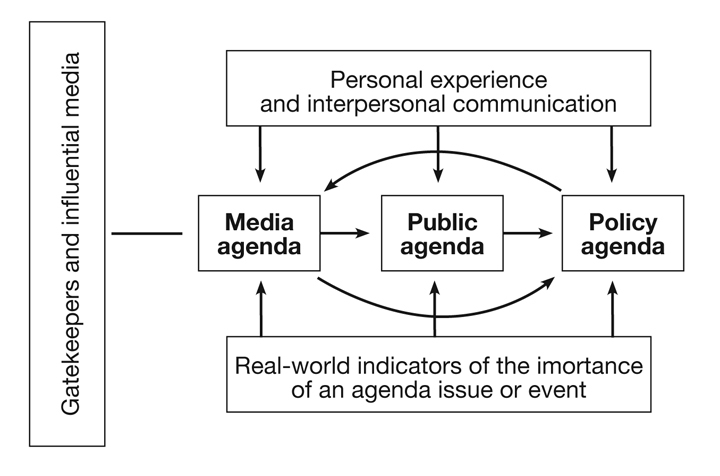 As a result, the media influence public opinion that, in turn, influences the policy agenda (figure 4). In addition, this model and Kingdon acknowledge other factors that influence policy outcomes including personal communication and real-world indicators. Research by the Pew Research Center showed that 55 percent of adults reported getting local news by word of mouth through friends, family, neighbors and colleagues at least weekly. Word of mouth was also the fourth most-cited source for local politics, campaigns and elections. That research also cited radio as a key information source for time-sensitive, local information. Print bulletins, newsletters and e-mail distribution lists also were cited as information sources about local news (Rosenstiel, et. al., 2011). As McCombs and Shaw said 25 years after they first began studying agenda-setting, the fruitfulness of the agenda-setting metaphor is documented by three features: (a) the steady historical growth of the literature; (b) its ability to integrate a number of communication research subfields under a single theoretical umbrella …; and (c) continuing ability to generate new research problems in a variety of communication settings. However, the success of agenda setting in those areas has not left it without its critics. Criticism of agenda-setting theory tends to revolve around one of three primary areas: (1) using correlation, a technique that can examine only a relationship, not causation; (2) the lack of longitudinal data, focusing instead on cross-sectional data; and (3) overuse of “the media” and “public opinion” as research components. One of the intuitive problems with agenda setting — and with any study based on correlation — is the direction of the causality: Does the media cause the public agenda or vice versa? Like McCombs and Shaw two decades earlier, W. Russell Neuman (1990) showed that there is a relationship between the relative quantity of media coverage and the percentage of the population identifying the issue as salient, at least when examining large national issues such as racial unrest and the Vietnam War. However, he also discovered notable exceptions, such as Watergate. While there was substantial media coverage, there was not a corresponding peak in public concern. At its peak, only 21 percent of the population identified Watergate as one of the most important problems facing the country. Issues such as inflation and unemployment have received relatively little coverage in the media, but the public continually recognizes them as important issues. His study was also problematic for the concept of agenda setting. Not only did it find that sometimes the media coverage would precede the public opinion, as coverage of the energy crisis did during the 1970s, but also it revealed that sometimes media coverage lagged behind public opinion. Although seemingly inconclusive compared to other studies, as he said, in some cases, the public appears to have a much steeper “response function” in reacting to real-world cues than the media does. In other cases, the media seem to be more responsive. While Neuman’s study began to look a direction of influence, to examine causality in practice, Shanto Iyengar and his colleagues devised an experiment, using national issues such as energy, defense, inflation, pollution, unemployment, civil rights and drug addiction. In their study, they allowed randomly selected residents of New Haven, Conn., to view an altered nightly national newscast to discover whether the amount of time devoted to a particular subject altered the participants’ rating of the problem’s importance, of the need for governmental action, of their personal concern or of the extent to which they discussed each subject with friends. Their experiment proved the agenda-setting hypothesis. In the group that viewed a newscast with altered content regarding defense preparedness, the participants grew more concerned about defense during the six-day experiment as did the group examining coverage of pollution. A third group that had expanded coverage of inflation saw no significant increase in the importance of that item to the viewers. “With a single and, we think, forgivable exception, viewers exposed to news devoted to a particular problem become more convinced of its importance. Network news programs seem to possess a powerful capacity to shape the public’s agenda” (Iyengar, Peters and Kinder, 1982). They extended their study to examine whether the effects of agenda setting were affected by the individual’s knowledge of the subject. They found that those with little political information, the less well-informed, are the most disadvantaged in agenda setting. “The well informed resist agenda setting through effective counter-arguing, a maneuver not so available to the less informed” (Iyengar, et. al., 1982). In short, as the authors conclude, the more “alert” viewers are, the more able they are to defend themselves against the media’s priorities. Their research, together with their later work linking agenda setting to the psychological approach, provided sound experimental foundations to the agenda-setting theory. “For perhaps the first time, the agenda-setting model has been tied to an established theoretical perspective in an explicit and unambiguous manner” (Kosicki, 1993). Erbring, Goldenberg and Miller (1980) make another important point that is also cited as a weakness of many agenda-setting studies: “The process of agenda-setting obviously takes place over time, not across regions, states, localities or individuals.” The insight has methodological implications for other agenda-setting studies that use cross-sectional design or case-study design. There can be little doubt that a cross-sectional design conducted at a specific date or dates is the least appropriate for the study of agenda-setting effects. Others made the same point and noted how the literature lacks the temporal emphasis. “Time … is a crucial matter in agenda setting. But, like many other matters, it is insufficiently theorized and underspecified” (Kosicki, 1993). In an abbreviated meta-analysis, Wayne Wanta and Salma Ghanem (2007) concurred that longitudinal studies were more successful than cross-sectional studies. They said it is possible that agenda setting is more of a long-term effect and does not show up in a one-shot survey. Another weakness in the literature is the emphasis on the role of the media in agenda setting. Issue concerns can and do arise from sources other than the media, including personal experience, group perspectives and real-world conditions. Differential media treatment is simply one factor that determines the salience of issues. The absence of correlation between media coverage may conceal actual media impact if that impact is offset by prior audience differences and the appearance of correlation may be spurious if it merely reflects parallel audience and/or contextual differences. The lack of certainty, they acknowledge, makes the determination of the role of the media in agenda setting difficult at best, and they find that diffusion of problem salience through networks of informal social communication overrides early news media impact (Erbring, Goldenberg and Miller, 1980). One case study brought this point home when the researchers found that the National Basketball Association itself, as part of its public relations effort, had directed the creation of content related to the NBA. “[S]imply accepting the mass media as the sole agenda-setting power without recognizing the important role of content providers, the organizations with an agenda to promote and transfer to the public, operating as advocates for their organization is to neglect a critical phase of the creation of mass media content. The relations between the mass media and organizations providing media content, whether the NBA, government or corporations, must be considered in the agenda-setting process” (Fortunato, 2000). At the very least, the role of the media must be taken in context with other potential agenda setters. Of course, as a case study, it faced all the problems of that methodology as Campbell and Stanley (1963) point out. The study was limited in terms of the entities (one) and variables that were investigated. Because the primary methodology was interviews of NBA officials over a short period of time, the study also provided little longitudinal insight, another failing cited by Campbell and Stanley. While still interesting and insightful the case study is particularly difficult to generalize. Keeping the role of the mass media in perspective will become even more of an issue as new media, particularly electronic media, allow people more input into the policy agenda through direct access to their representatives and as blogs and other media allow for more grassroots, yet virtual, organizing of interested parties, parties that can literally get their voices heard at the speed of light without any of what Lippmann said was one media role: determining what the public considers to be important. In fact, the biggest challenge to agenda-setting theory remains to be seen — the change in the mass media itself. As Steven Chaffee and Miriam Metzger (2001) have said and others (including Delwiche, 2005) have confirmed, the key problem for agenda-setting theory will change from what issues the media tell people to think about to what issues people tell the media they want to think about. They also pointed out that the change will bring challenges to agenda-setting research itself. Further criticism comes from the continued examination of newspapers. Despite declining advertising revenues and circulation, the Newspaper Association of America continues to report increases in daily newspaper readership, a readership of 150,674,000 adults on weekdays (Newspaper Association of America, 2005). Local citizens still have few places to turn for news about their local governments except a local newspaper. Internet sources, possibly excluding those of local newspaper Web sites and radio/television stations, do not devote as much energy to local issues as regional or national ones. In terms of a critical look at agenda setting, it is not simply the agenda-setting theory that has come under attack. The related ideas of Kingdon and Michael Cohen, James March and Johan Olsen (1972) have also come under attack at fundamental levels. Using two national issues, tax reform and deregulation, as case studies, Gary Mucciaroni (1992) criticized the Garbage Can Model and Kingdon’s use of it in agenda setting. Mucciaroni asked three salient questions: Does the model provide (or lead to) a set of testable propositions for predicting the direction of agenda change? Does it have sufficient appreciation of the impact of historical and institutional constraints on agenda setting? Is the model’s assumption of a loose and independent relationship between problems, solutions and politics warranted? The shortcomings of the model, Mucciaroni concludes, do not diminish its strengths. The model captures much of the complexity, fluidity and unpredictability of agenda-setting and highlights the important role of chance, innovation and human agency in policy making. He proposes that the model be used as a general framework for developing more specific models that would allow us to predict the kinds of conditions necessary to get a problem or solution on the agenda. He also proposes that the model be refined to focus on how institutional factors shape, constrain and facilitate factors reaching the agenda. And finally, noting that the key to agenda setting in the Garbage Can Model is the simultaneous occurrence of a salient problem, of an available solution and of hospitable political conditions, he proposes that the model be reformulated to stress the importance of linkages between problems, solutions and politics rather than their independence. Despite criticism, the ideas surrounding the interactive role of the media in policy, politics and public opinion, remain entrenched in the literature and warrant further study. To that end, five hypotheses drive this research. The first set of hypotheses, looking at the correlation between coverage and policy change, resembles earlier studies that looked at the correlation between public opinion and coverage. The second hypothesis considers what impact the ability of a newspaper to do specialized, local reporting might have on policy outcomes. Thinking that a newspaper with greater market penetration might have more of a chance to impact change, the third hypothesis looks at the relationship between market saturation and policy change. The fourth hypothesis begins to examine the new media, the Web, by determining the impact a Web presence has on policy change. The fifth, and final, set of hypotheses looks at whether there is any relationship between who owns the paper and any impact on policy change. The vast majority of agenda-setting research focuses on national issues from basketball to nuclear energy, issues most people can observe only from a distance. Local issues are not remote. They are part of the practical concerns that occur every day as people navigate down potholed roads to the grocery store, observe crime on the streets, visit with firefighters in their hometown or pay local property taxes. A person does not need the media to inform him that there are potholes in the road or trash piling up on the curb or that it takes 10 minutes for an ambulance to arrive at their house instead of five. “Neighborhood interpersonal networks are often heavily laden with content arising from personal observation. … Every citizen of the community is a potential initial source for such local political ‘news’ ” (Palmgreen and Clarke, 1977). David Demers (1996) validated the agenda-setting ideals by showing that, at least for weekly community newspapers, the greater the personal experience in the community, the greater the reading. While agenda-setting studies tend to show correlation, not causation, Demers shows that community experience leads to greater media consumption. 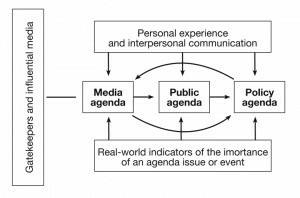 While most agenda-setting studies focus on media consumption leading to community involvement, Demer’s work supports having bi-directional arrows in the model of agenda setting leading to policy outcomes. Robert Spitzer (1993) found that media outlets play a pivotal role in influencing policy because they are the conduits, the pipelines, the funnels regulating the flow of communication between policymakers and others in the political system who might seek any different policy. Haven Simmons also found that a series of 120 news articles, 21 editorials, five opinion articles and one sports article made a difference in one policy outcome. Pointing out that the coverage may have been beyond what was normal, the mayor of the town said, “I’ve never witnessed this much coverage on a story. They didn’t write this much about World War II. With enough brainwashing and printing one side of the story, people will believe it” (Simmons, 1999). A city council member, after losing his re-election campaign at least in part due to the issue surrounding the location for the complex, said, “We couldn’t counteract the newspaper’s coverage of the public safety complex. It was overwhelming” (Simmons, 1999). The publisher said the Bradenton Herald’s agenda was to stimulate public discourse about the proposal rather than influence public opinion concerning a preferred location for the complex. Certainly the paper influenced public opinion, the political agenda and the policy agenda. City policymakers ultimately scheduled a town meeting to receive more citizen input, altered the timetable for the complex and deleted the fire station from the proposed plans. In the election, voters rejected all three city council members who voted for the complex. It was clear, as Simmons concluded, that the newspaper set an agenda, which became the agenda, for public discourse and subsequent policy outcomes. Also using a hard-to-generalize, case-study approach, Marcus Brewer and McCombs (1996) examined an overt attempt to influence the public agenda by the San Antonio Light, which published, on the first Sunday of the year, “The Light’s 1992 Agenda — For the Children.” The study showed how the daily newspaper, through continual coverage all year long, helped lead to push children’s issues onto the policy agenda even if they were already high on the public agenda. With crime, health and education accounting for 59 percent of the coverage on children’s issues in the front section of the paper, the authors noted that numerous items saw increases in spending as part of the city budget, which funded job training, parks and recreation, police youth programs, children’s resources and youth services. The overall increase in funding for children’s services was nearly $6 million, a significant increase. After city council members read the articles and the letters to the editor, there was a political response to the needs of the local community based, at least in part, on the coverage given to the issues by the newspaper. Indeed, limited but significant research on local governments shows that local governments are almost immune to change despite the fact that local budgets drive policy decisions. As part of his movement on Reinventing Government, David Osborne (1993), among others. pointed out the waste built in to the system. He pointed out, however, that budgets can be responsive to external forces, and one of those external forces (the media) is the focus of this research. The traditional line-item budget system incorporates rules that encourage managers to waste money. In the traditional line-item system, money is cut up into many parts, and it is often difficult to move it from one line item to another. If every penny in every line item is not spent every fiscal year, it is lost and less money is allocated the following year. The built-in incentive is to waste money. There is a very simple solution, which, to the best of my knowledge, was invented in Fairfield, California. With the passage of Proposition 13, Fairfield lost a quarter of its revenue overnight. Out of desperation, the city decided to change its budget system: Line items were eliminated, and each agency was assigned a budget number. Agencies were allowed to roll over unexpended money from one fiscal year to the next. This change saved Fairfield millions of dollars. Another very positive outcome was the change in the behavior of managers and employees. Empowering the manager and employees to design their own budgets enhanced motivation and creativity. Budgets soon reflected the mission and needs of the agencies; they were no longer dictated by line items or by individuals far removed from agency operations. While it seems the media may impact the passage of some legislation or change in policy, the magnitude of the media’s impact is unclear. Also, the media are not the only instigators of change. Meagan M. Jordan said local governments are eventually prone to agenda-setting effects because of characteristics such as changes in federal grants and tax changes. Jordan examined police, fire, sanitation, public buildings, parks and recreation and highways using local government budgets obtained as part of the U.S. Census. She concluded that policy influences the shape of the agenda by directing what policies local governments will implement. “Most budget changes are small increases because policy entrepreneurs are working to maintain their interests on the agenda.” For public administrators, the research raises a desire for caution. Normally, budgeting relies heavily on normal curves and linear growth. However, breaks from the status quo demand adjustment and trade-off. “Therefore, understanding and participating in the agenda-setting process is an important and necessary skill” (Jordan, 2003). Still, the budget is an appropriate choice for use as a dependent variable not only because it is substantiated in the literature but also because the budget is extremely sensitive to political, economic, social and legal environments. The proximity of local governments to citizens means that public opinion will play a key role in shaping spending decisions. “If all politics is local, as Speaker of the House Tip O’Neill famously proclaimed, then all economics is local, too — despite globalization. Local places matter — cities, subnational regions, federal states — they are not just sites to study as component cases of larger economic processes. Local developments can propel or change national and global economies” (Bardhan and Walker, 2010). Previous research has clearly shown that media coverage can affect public opinion. A logical next step is to establish the link between media coverage and policy outcomes. As Robert Bland (2007) says in his budgeting guide produced for the International City/County Management Association, the budget has evolved from being a tool for accounting to being a tool for strategically and logistically positioning a community to capitalize on historical strengths and emerging opportunities. Knowing the role of the media in capitalizing on those opportunities will be an asset for administrators. The budget, however, is not a perfect tool. As Aaron Wildavsky (1979) showed in his extensive look at the budget as a proxy for politics, the budget changes tend to be incremental, changing more often as part of an annual re-evaluation than as a response to changes in local laws or policies. Mortensen and Serritzlew (2006) focused on budgetary decisions across 191 Danish municipalities over a 13-year period. Budgets provide a condensed measure. If, as they hypothesize, the media presence generally expands the scope of conflicts, then more media coverage and competition should lead to more punctuated conflicts and more dramatic shifts in the composition of the political agenda. As a consequence, budgetary decisions will be more volatile over time. Local media coverage will add to the spending (or budget cutting) pressure on politicians. “[F]rom a policy-output perspective, public budgets provide a condensed measure of policy with several advantages compared to most other policy indicators. If public spending is not affected by the media, then this is an empirical finding that tells us something important about the outer limits of media effects” (Mortensen and Serritzlew, 2006). Jordan (2003) uses local government expenditures in combination with Punctuated Equilibrium Theory to show that budget functions are more prone to punctuations and, therefore, have a less stable agenda. Jordan examined six areas of interest to local governments — police, fire, sanitation, parks, roads and public buildings — and shows that most budget changes are small increases because policy entrepreneurs are working to maintain their interests on the agenda. Originally Wildavsky, in 1964, reasoned that the largest determining factor of the size and content of this year’s budget is last year’s budget. However, as Joseph White maintains, “Nobody, least of all Aaron Wildavsky, would seriously maintain that all budgeting was totally predictable from a combination of last year’s spending and some economic and political summary variables” (Wildavsky, 2001). Indeed, Wildavsky (2001) maintains that budgets are responsive over the long run. Priorities and levels of spending change through incrementalism, the accumulation of numerous small decisions. Still, he notes that sometimes changes may be more abrupt and deliberate. Although neither Jordan nor Wildavsky state the concept, it could be that the media provide the punctuation for the non-incremental changes. A budget punctuation represents a shift in priorities. While Otto Davis, Murray Dempster and Wildavsky (1966) convincingly explain that this year’s budget is based on last year’s budget with special attention given to a narrow range of increases and decreases in making decisions in the face of complexity, their work elicited criticism, particularly pleas for the definition of an increment. “But, we insist, it would be wrong for us to provide a precise answer to an under-specified question.” Instead, they focused on explaining the concepts (Dempster and Wildavsky, 1979). An incremental process is one in which the relationship between actors are regular over a period of years, and a non-incremental process is one in which this relationship is irregular. … The size (or lack thereof) of the increment or the method of calculation used do not matter so long as the relationships between bureaucrat and Congress remain regular. Put another way, it is the regularity or irregularity of the changes in size that matter, not the absolute amount of the changes themselves (Dempster and Wildavsky, 1979). Nevertheless, Natchez and Bupp (1973) insisted it was the fundamental constructs of the idea that were flawed. “The whole metaphor of an inert bureaucratic machine doing the same thing this year that it did last year missed the point. … Priorities are established by aggressive entrepreneurs at the operating levels of government,” they said. One of Wildavsky’s students, John Kingdon, in his multiple streams model, further advanced this concept of entrepreneurs taking advantage of an opportunity (Kingdon, 2003). Baumgartner and Jones (1993), as part of their Punctuated-Equilibrium Theory, maintain that while a political system does display considerable stability, the stability is punctuated with periods of volatile change (also see True, Jones and Baumgartner, 1999). Still, Wildvasky’s work explains a great deal of the workings of bureaucracy even if it does not satisfy all its critics. George Gladney (1990) asked editors to rank standards that would lead to improving the quality of their publication. “Strong” local coverage ranked at the top of the list — above accuracy, good writing and visual appeal. And, “Although definitions of quality vary, most editors will tell you that having adequate resources in the form of news hole, numbers of reporters and wire services are at least preconditions to achieving quality. An understaffed newsroom with a limited newshole will not produce as high a quality journalism as a newsroom with sufficient staff and newshole” (Cho, Thorson and Lacy, 2004). Similarly, a 2001 study by the Readership Institute at the Media Management Center at Northwestern University studied 100 newspapers and surveyed 37,000 readers to identify what it would take to grow readership. Eight “imperatives,” everything from improving service to emphasizing certain kinds of content to making the paper easier to navigate, were included. The broad “imperatives” were broken down into components on which newspapers could focus. At the top of the list focusing on content — “readers want and expect a wide variety of content from their local newspaper” — was “intensely local, people-focused news.” It includes “chicken dinner” news — community events — but is not limited to events. It includes stories about ordinary people, and it could be reasonably concluded that the reader desire extends to coverage of other news topics through their effects on ordinary people. It also includes obituaries, which at their best can be engaging stories about people’s lives. The same study found that readers care more about how the story was written than about who wrote it. Larger newspapers have staff members who can spend time working on “enterprise” stories, longer, more in-depth stories that go well beyond the surface of a topic. However, smaller newspapers often cannot afford to hire a large enough staff to dedicate to specialized reporting. All of the reporters are general assignment reporters, and they rarely establish long-term professional relationships with sources or report on beats that would give them long-term knowledge of a topic. Anecdotal evidence says that a newspaper should employ one news-editorial staff member for each 1,000 circulation. For 1995, the actual staff rate was 1.04 (Meyer and Kim, 2002). Smaller papers will have more staff per thousand, as table 1 indicates. Philip Meyer and Minjeong Kim found that newspapers with high staff ratios had better circulation. However, they left for future research how deployment of additional staff could enhance circulation figures. If the additional staff member is devoted to the content that readers want the circulation should increase. H3: The higher the quality of the newspaper as measured through market saturation, the higher the correlation between local coverage and policy change. News people relate quality to variables such as fairness, accuracy, variety of content, breadth of coverage, vivid writing, attractive makeup and the like. Ultimately, however, product quality is always a matter of subjective judgment. From a consumer’s point of view, the newspaper that provides information in the most usable manner will be the paper of higher quality. Using peer assessment is another method of determining a newspaper’s quality. How many awards has the publication won? While they are an indicator of how that newspaper compares to its peers, the standards are subjective and hard to identify. A 2001 study examined the differences between large papers and smaller papers, potentially introducing other measures of quality. The larger papers carried more staff-written material (44 percent) than the smaller papers (29-31 percent). The smallest papers contained content (55 percent) with more focus on local, state and regional news (Bogart, 2004). Each of the measures, however, has its problems, including being hard to measure, being hard to compare or being completely subjective. Competition comes not only from radio and television but also from the World Wide Web. Particularly for young mass media consumers, the picture of the world is much less likely to come from a newspaper than from Internet or from a television show such as Jon Stewart’s “The Daily Show” or Stephen Colbert’s “The Colbert Report.” A report released in 2007 by the Joan Shorenstein Center on the Press, Politics and Public Policy at Harvard University showed that not only do young people not follow the news closely but also what news they did get certainly did not come from newspapers. Only 16 percent of 18- to 30-year-olds surveyed in the study said that they read a newspaper every day, and 9 percent of teenagers said that they did. For comparison, 35 percent of older adults said they accessed a newspaper’s pages every day. However, 20 percent of teenagers said they accessed the Internet for news every day, and 20 percent of older adults said they accessed the Internet for news every day (Patterson, 2007). The research also helped to paint a portrait of the kind of person who uses newspaper Web sites and why they use such sites (table 2). Like readers of the print editions, consumers of the online editions tend to be well-educated individuals with above-average income who want to be aware of local and regional news (tables 3,4). In short, they are people who are likely to be decision makers in local communities. 78% say they find information most easily on newspaper Web sites. 83% say their newspaper site will be among their primary destinations five years from now. 72% say they would miss their newspaper Web site if it were no longer available. To that end, the Web presence of a newspaper cannot be ignored. While the online edition may not count in Audit Bureau of Circulation figures, it is clear that a Web presence gives readers another significant opportunity to learn about the happenings in their community. The issues at the local level are different from the issues at the national level. Differences are also apparent concerning the local media and the ways consumers view the local media as opposed to national media. Residents of smaller, more homogeneous communities want their media to be agents for promoting social consensus (Janowitz, 1967). Residents of larger, more diverse communities want their media to disseminate controversial information. Open discussion of conflict in the larger communities is healthy (Tichenor, Donohue and Olien, 1973). Consumers go to their local media to get their news about politics (candidates or issues). Specifically, they go to their local television more than to cable TV news or to network TV news and acquire news from local newspapers more than from national newspapers or their Web sites (Harris Interactive, March 6, 2008). People tend to trust entities that are locally based more than those that are nationally based (Sinclair and Löfstedt, 2001). While it would seem rational for a nation with a vast diversity of people and places, local civic decision-making and a multiplicity of local self-governing units, it would also seem reasonable that the locally owned media in America would foster trust. However, the vast majority of media are not locally owned. Time Warner, The Walt Disney Company, Murdoch’s News Corporation, Viacom and Bertelsmann dominate ownership of the world’s media from small-town newspapers to massive, 24-hour television stations. During the past two decades of media consolidation, newspapers from Emporia, Kansas to Salem, Oregon found that being a part of a chain meant reduced freedom. They cited examples of being told to endorse the same national candidates to being told to increase profits by cutting back on the size of the news hole or the size of the reporting staff (Bagdikian, 2004). One researcher found that papers once competitive but made monopolies by chains produced “higher prices and lower quality” (Eversole, 1971). Further, chains tend to hire less qualified journalists and tend to avoid the controversy that readers said they liked in the national media. One study showed that after an independent paper is bought by a chain, the general result is not helpful to readers who seek guidance on local matters when they turn to the editorial pages of their daily papers (Thrift, 1977). Bruce Plopper showed that when Gannett took over the Arkansas Gazette in 1986, the Gazette’s circulation declined and the paper no longer dominated its highly competitive market. However, under the stewardship of a new editor, the publication saw an increase (from 64 percent to 73 percent) in local news coverage and a significant decline in national and international news. Specifically, the change meant an increase in coverage of politics/government, crime/accidents with a decline in human-interest coverage. “There was a large decrease in space allotted to general news, evidenced by a corresponding decline in average column inches devoted to all but one of the news categories analyzed by geographic orientation and topic category. … There was also a marked increase in the average daily percentage of the newspaper devoted to local/state news, complemented by declines in national and international news coverage” (Plopper, 1991). While the ownership of newspapers by chains continues to drive down the monies allocated for the production of the product in favor of driving up the profit margin, newspapers owned by publicly traded companies face higher hurdles. Newspapers owned by public companies, companies that tend to put shareholders and financiers above community, advertisers, readers and employees, often focus on short-term profitability as well as on consistency in return and earnings predictability. The more detached owners are from journalistic practice, the greater pressure they will apply on management for consistently high and growing profits (Chang and Zeldes, 2002; Blankenburg and Ozanich, 1993; Lacy, Shaver and St. Cyr, 1996). Agenda-setting as a formal concept will celebrate its 40th anniversary in 2012. In the four decades of research surrounding the concept, researchers have documented conclusions through case studies, through longitudinal studies, through cross-sectional studies and through experiments the correlation between public opinion and mass media coverage. Researchers have also brought in additional concepts and other factors, particularly interpersonal communication and real-world indicators, as they examined what influences public opinion. Researchers have made the conceptual leap between getting something on the public’s agenda and moving from there to the policy agenda to instigate change in the community. They theorize that to have real impact, the media must do more than simply inform readers or viewers. In addition, the media must be instigators of change. In his 1984 article, “The Frustrations of Government Service,” Bruce Adams issued a challenge to the media: “The challenge for the press should not simply be to cut back on gossip and sensationalism but to make a commitment to presenting a more balanced view of public affairs — a view that would include stories of government programs that work and help people as well as those that do not, a description of government officials who make those programs work as well as those who do not.” The media are on the minds of public administrators daily, with every decision they make or shy away from, because the decisions might not look good on the front page of the hometown newspaper. For nearly four decades, researchers have focused almost blindly on public opinion, a concept they have difficulty defining and describing, and have generally neglected examining policy outcomes as a measure of the impact of the media. As Lippmann (1922) said, public opinion is irrational and includes often self-serving perceptions that influence individual behavior and prevent optimal social cohesion. However, researchers seem infatuated with broadening understanding of this irrational, but still important, concept. Moving beyond examining public opinion, the main theme of this research project is to broaden the bank of knowledge about agenda setting and its impact on policy and on tangible, rational change in a community. Thanks to the hundreds of research projects that have been undertaken during the last 25 years, leaders are aware that the mass media influence what consumers have knowledge of as well as what they know about the subject. The public can be certain of the direction of causality thanks to experiments done in the 1990s. However, citizens and leaders still know little about the impact of the media on local government policy outcomes. They need more information to answer the question, “Does media coverage of local issues influence the actions of local governments?” Evaluating a variety of potential factors that might influence the impact of any such change is the question at the center of this research. It will end in a challenge for public administrators: If the media do indeed impact policy changes at the local level as much as media outlets influence public opinion at the national level, administrators must become even more media savvy and must use all forms of media at their disposal to get information, to make well-informed decisions and to propose policies that are in their best interest of their communities, popular or not. Gladney (1990) showed that small-paper editors tend to place greater value on community leadership, strong local news coverage and community press standards. The rankings and ratings showed the expected pattern for community leadership, with weekly editors clearly partial to this standard. Editors of weeklies and small dailies gave a higher ranking than did other editors to strong local news coverage although all editors gave this standard a high rating.